Thankful Thursday: Bloggy Goodness Edition! Oh gee! Is that the time? Normally, I might ask, “How did this happen?” or wax poetic about the day getting away from me, but you know what? Thursday was a bit kooky and I know exactly how this happened and where my time went. Today was a very weird day. It felt at once like a Friday (Yay!) and a Monday (Boo!). That is simply not a good feeling for tired parent brains. We had the day off yesterday for Remembrance Day and tomorrow is an Assessment and Evaluation day for teachers, so for the second time this week the Things don’t have school. Thursday was just a weird day from beginning to end. The chaos of the morning took its toll and I decided it was better for my kids to make their buses happily than it would have been to have a couple of cranky curmudgeons, stressed to the max, running late. This meant, of course, that Mom’s Delivery Service was going to have to hit the road with lunches, etc. This also meant that my morning was gone in the blink of an eye. Oh well. That’s life as a parent. It’s a constant pull between enabling and teaching. Is this the right time for natural consequences? Am I doing them a disservice by bringing them the things they need? Will they never remember to hand in those assignments that are in their backpacks? Should I let them squirm a little wondering if they will have lunch today? Let me save you some (precious) time. No. Natural consequences happen naturally all the time. The chaos of the morning was out of the ordinary today and certainly not the fault of anyone in particular. It wouldn’t have helped to assign blame. It would have added to the tension that was already brewing, though, and no one needed that. No. I am not doing them a disservice by remaining calm and making sure they get to school on time. No. No. That’s just mean. I don’t want them to worry that they won’t be fed. Who would want that? No one, right? I hope no one would want that. Life is stressful enough without tossing fear of food security in the mix. No. Just no. All this to say, I thought maybe I would share some of my favourite parenting blog posts here tonight instead of writing very much myself. (Oops! Too late!) Sometimes the best cure for wondering and worrying about whether or not you are doing the right thing, is to read what other people are doing. Sometimes it makes you think. Sometimes it makes you laugh. Sometimes it makes you cringe. Sometimes it simply takes your mind off of your own private little internal conflicts long enough for you to realize there’s nothing to worry about at all. So without further ado, I give you 5 blog posts I really appreciate. Next up this touching post from Curtains Are Open that highlights the, seemingly, crazy lengths great Moms will go to for their kids (and everyone else’s, apparently!) and the beautiful outcomes that can happen when you do. Have you been spending too much time with your iThing and not enough time with your eyes on your Things? Maybe we should all consider this post from Mommy’s Weird a litmus test. We have the power to unplug. We do! If you feel a sudden and acute lack of confidence about how you are raising your girls, at any time, please read this truly excellent post from Yummy Mummy Club. It’s all about the honesty. You’ve got this. Finally, I enjoy so much over at Schmutzie.com so often, I would be remiss to not include it here. I especially appreciate Grace In Small Things because well, I really do appreciate grace in small things. Who doesn’t? Go read. You will not regret it. I have so much to get done tomorrow. Tomorrow will take care of itself, right? First, this tired Mamma needs some serious zeds. Posted on November 12, 2015 by Peady •	This entry was posted in Family, Fridays, Happiness, Health, Kindness, Life, Mondays, NaBloPoMo, Parenthood, Things, Thursdays, Writing, Yay, cake! and tagged 5 blog posts I really appreciate, 5 blogs, education, family, Five Blogs for Fake Friday, Five Blogs I Really Appreciate, Five Parenting Blogs I Really Appreciate, happiness, happy, health, Jeni Marinucci, kids, life, NaBloPoMo, Thankful Thursday, Thing 1, Thing 2, Things, writing, Yummy Mummy Club. Bookmark the permalink. Ah yes, the joys of unexpected no-school days int he middle of the week. And the pitfalls of tired parent brains. Some days it makes me feel rather smug that two of my three have children of their own or are expecting their first, but to tell you the truth, it doens;t get any easier, it just gets…more. Yeah, that’s it. More! 😀 Hang in there super mom. Thank you so much for reading and commenting. That means a lot. I have to say that I adore you. 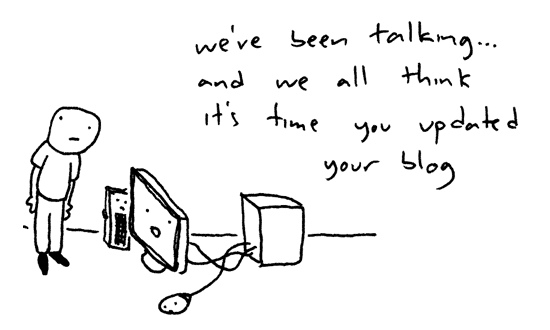 I love your blog posts and your tweets . Seeing your posts in my FB and Twitter feeds make my day. Agree with this one completely – sometimes I worry I run around for them too much, but I know it’s worth it – they will get there someday, and in the meantime, if I can help them out with (more) reminders and (more) bringing of their stuff and (more) managing of the schedule, then I’m up for it. It’s worth it! Does ANYONE ever remember all the things they need all on their own? And letting them wonder if they’d get lunch is not natural consequences, it’s bad parenting, IMHO. You did the right thing. My Thursday was Great! but still had a hint of Wednesday wandering in my mind.